After running around to potential customers and not having any time to eat, I finally had a chance to grab a bite before heading back home. 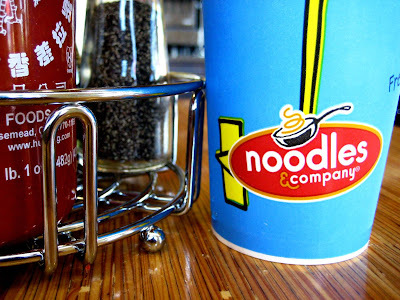 I stopped by this chain, Noodles & Company, because when you’re in the middle of suburban Maryland and starving, you just go to something that seems like it can’t be that bad. So there you go. And I love me some noodles, so I had high hopes. That’s what they have here – noodles! Lots and lots of noodles. Asian noodles, mediterranean noodles, and american noodles. And some soups and salads too. And a little bit of dessert. It’s a nice, bright, and airy space, and I think they have free wi-fi! I got the japanese pan noodles – broccoli, carrots, shiitake mushrooms, sprouts, sesame seeds, cilantro, and udon noodles in a sweet and spicy soy sauce. You pick your meat and I went with sauteed beef. The things that make up this dish are so good. 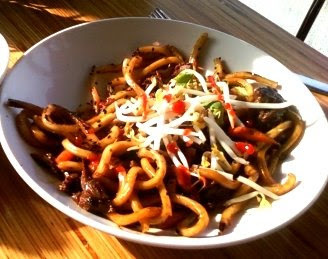 How can you go wrong with udon noodles, beef, veggies, and sauce? Well, apparently, in many many ways. The noodles were overly flavored. The sweet and spicy soy sauce wasn’t particularly a good flavored sauce. And it seemed to be only on the noodles. The broccoli was severely undercooked. I don’t like mushy broccoli, but this was practically raw. And the meat, which was really tasty and extremely tender, did not have any of the sauce on it at all. It’s as if they cooked up the noodles and veggies and sauce, and then just sort of dumped in some heated up meat afterwards. The meat was of high quality, and just tasted peppered, but had absolutely none of the sweet and spicy soy sauce flavor. So the components of this dish had tons of promise, but it was extremely poorly executed. But due to my starvation, I scarfed it down. Needless to say, I was highly disappointed. Oh well. It’s always a crapshoot when you go to a chain.